* Note: If using frozen meatballs, allow them to thaw to room temperature before starting recipe. Fill large pot with half gallon of water, bring to a boil and add salt. Add pasta, stir and cook for 10-12 minutes until pasta is al dente. When the pasta is finished cooking, drain and set to the side. While pasta is boiling, make ricotta mix: In medium mixing bowl add ricotta, eggs, garlic, pepper, parsley and grated parmesan cheese. Mix until ingredients are blended and there is a smooth consistency. Transfer mixture to large bowl. Add cooked pasta and stir until pasta is evenly coated. Slice meatballs and set to the side. 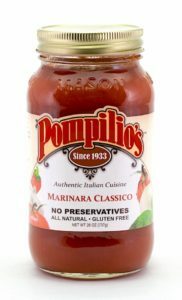 Lightly coat the bottom of baking dish with Pompilio’s Marinara Classico. For first layer, place 1 scoop of penne and ricotta mix and pat down to create an even layer across. Next, evenly lay sliced meatballs across the dish and top with the shredded mozzarella cheese. Top with medium layer of Pompilio’s Marinara Classico. Repeat layers one or two times depending on pan size. Wrap pan with aluminum foil and transfer to oven. Cook for 45 minutes to an hour or until it reaches temperature of 145 degrees. Take out of oven and let set for 10-15 minutes. Once dish has set, cut and serve.